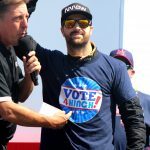 James Hinchcliffe has a special message for fans (so sweet!). Also, Dave Furst interviewed him on his dances. Thanks to Abby for her help all season with goodies on James. Here’s to tonight! Oh, this is so fun. 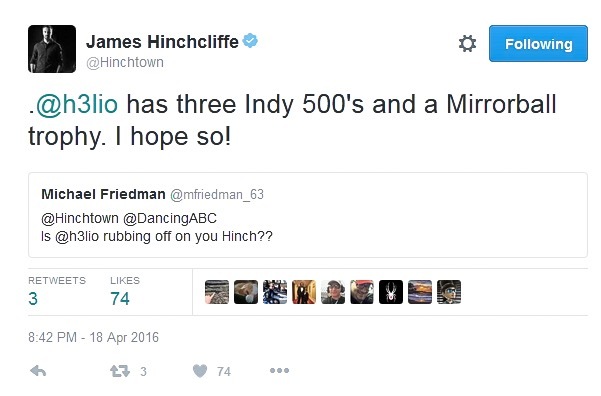 Below you can see Helio Castroneves having a dance off with James Hinchcliffe! Hilarious! 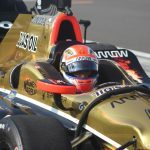 What a cool interview with James Hinchcliffe and Helio Castroneves. Another Must see. Thanks to Abby for this find. 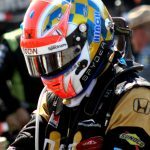 James Hinchcliffe talked about Dancing With The Stars in the most recent podcast at this iTunes link. 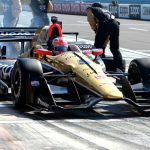 I haven’t been able to listen to it yet, but, Court tells me Helio Castroneves was a guest and they talked a lot on the show. The Indystar also has a new article on James and his odds to win. They’ve quoted some of the same quotes they’ve had in another recent article, but, it’s a great read. I love James competitive spirit and hard work ethic. An online gambling site gives the 29-year-old Toronto native reasonably good odds to win the event. 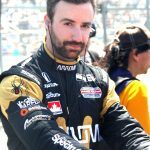 Hinchcliffe and Burgess, one of the show’s better choreographers and dancers, are ranked fifth of the 13 couples by SportsBettingLine.com. And is their no doubt these two are having a great time? Key! Let’s hope we get to see a rehearsal interview soon. 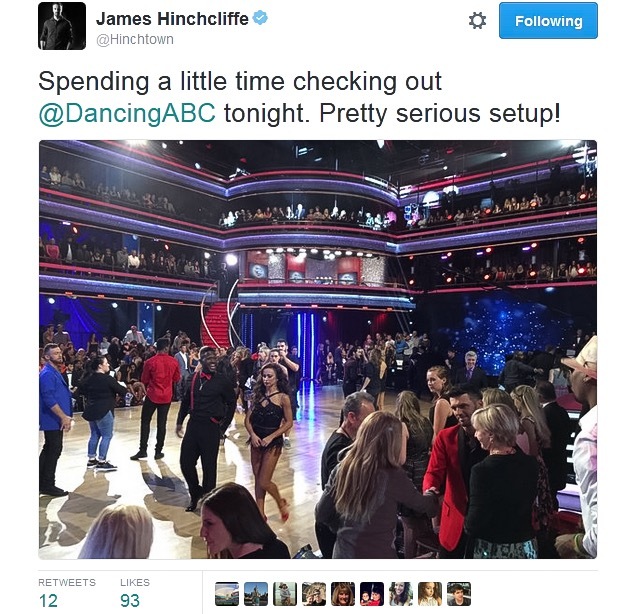 DWTS Season 23 – Derek Hough is Once Again Blogging for TV Guide, Talking James, Jana and Hairspray Live! Hey everyone, give it up for Vogue who is handling both this site and Purederekhough.com while I take a sort of vacation where I’m away from home but my work won’t leave me alone. 😉 Anyway, Derek is once again blogging for TV guide – he seems impressed with James and he’s “hanging out” with Jana. I’ve put an excerpt below – click the link to read the whole thing. Thanks to Linz for the heads up. Thanks so much for all your messages so far. I’m really excited to be back this season — something I didn’t think would be happening even a few weeks ago. But I truly believe everything happens for a reason. My Broadway show Singin’ in the Rain got postponed from January until sometime late next year, which freed up a lot of time for me this fall. I was excited to do some other stuff. I’ve been working on some cool music and videos with Lindsey Stirling that I will hopefully release soon. And you know I love Dancing with the Stars. There’s nothing like it in the world. I’ve always said if I can come back and they will have me back, I will. Marilu is also amazing because she has super memory! It’s actually called highly superior autobiographical memory (HSAM), which means she has the ability to remember everything she’s experienced every day down a minute detail. So you must think she’s got to memorize choreography easily, right? The funny thing is it’s not exactly like that. She’ll forget certain things or there might be some things she physically can’t do yet, and if you tell her she forgot, she’s like “What?! No way!” It’s like an affront. It’s very cute. I think for her it’s weird to forget something. But the thing about dancing is that it’s not about remembering things on a cognitive level. You have to remember moves and steps, but you also have to embody all of it. It’s more like muscle memory. I think she’ll get used to that soon. The cast this season is great bunch. They’re all really nice. I’ve hung out with Jana Kramer a little bit. 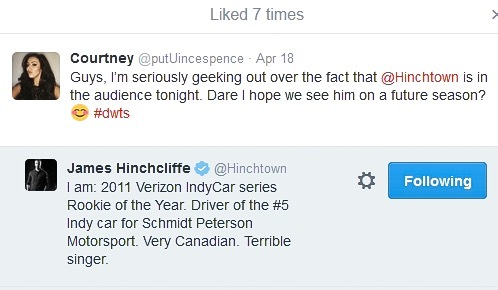 I’ve been really impressed by James Hinchcliffe. I think he might be an underdog. He’s another Helio in the making. He’s got a great personality and is a really likeable guy. Then I saw him rehearse and I was like, “Wow!” I think he’s definitely someone to watch out for. 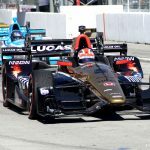 James Hinchcliffe and Sharna Burgess held a facebook chat today. You can listen to them talking about their rehearsals for Dancing With The Stars so far. You can also see Derek Hough and Marilu Henner Jiving in the beginning. There is also some Good Morning America talk ….and a lot (and I mean A LOT!) of goofiness (can’t fans ask more dance related questions instead of all the silly, lame questions? Amen Court at twitter! If they don’t hold more chats, I wouldn’t blame them.). Thanks to Idolxfactor1 for recording. 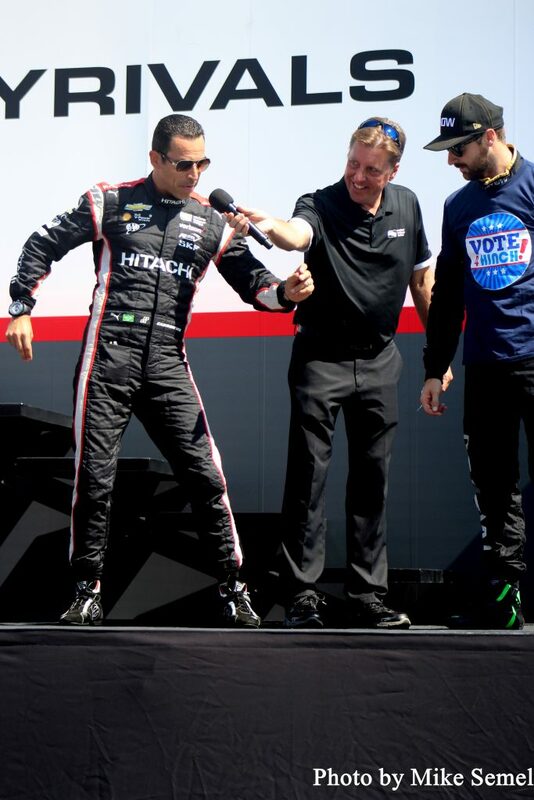 During the driver introductions at the Watkins Glen IndyCar race Sunday, September 4th, Dancing With The Stars Season 5 Champ Helio Castroneves gave James Hinchcliffe some dance advice. Mike Semel took these stunning shots and sent them to us. 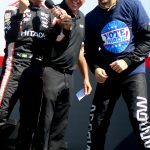 Note how James’ shirt says “Vote 4 Hinch” and check out those dance moves! Thanks Mike!!! Too fun!! Click photos for a larger size! Oh, this is too fun!! If you are living in the Fort Lauderdale, Florida area, be sure to see “Dancing Pros Live“. Dancing With The Stars Season 5 champion Helio Castroneves will be joining the cast. Here is some more info from Broward Center. You can buy tickets at the same link. For the first time together on stage, see professional dancers from “Dancing with the Stars,” “So You Think You Can Dance” and dance champions from around the world compete with one another for your vote in Dancing Pros: Live! Using electronic voting remotes attached to every seat, the audience will become part of the show and vote for their favorite couple. Prepare to be dazzled by amazing caliber celebrity and professional dancers, singers from “American Idol” or “The Voice,” a glamorous set, stunning costumes, group numbers and unbelievable dance moves! 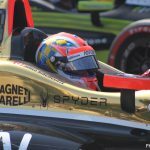 This amazing cast along with Karina Smirnoff (Head Judge), Alan Thicke (Host) and starring Edyta Sliwinska and Chelsie Hightower from Dancing with the Stars, will be joined in South Florida by Dancing with the Stars Season 5 winner and 3 time Indy-500 champion Helio Castroneves.